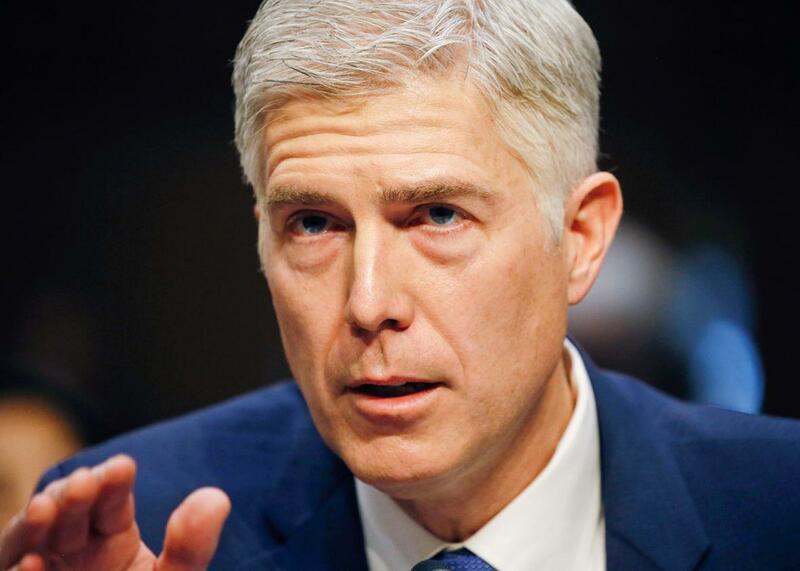 Neil Gorsuch’s arrogant “frozen trucker” opinion shows he wants to be like Scalia. The judge’s infamous dissent reveals he may not have the temperament to serve on the Supreme Court. Supreme Court nominee Judge Neil Gorsuch testifies at his Senate Judiciary Committee confirmation hearing on Capitol Hill on Monday. I have tried to be balanced in reviewing Judge Neil Gorsuch’s record. In a post right after his nomination, I called his decision criticizing “Chevron deference” (Gutierrez-Brizuela v. Lynch) brilliant, a thorough and deep defense of judges deciding “what the law is” rather than deferring to agency officials. His opinion in TransAm Trucking v. Administrative Review Board, though, exposes a big hole in Gorsuch’s anti-Chevron theory, showing that judges can abuse statutory interpretation just as badly as bureaucrats. Gorsuch’s opinion in what’s known as the “frozen trucker” case also demonstrates an arrogant and cold judicial personality. I have read very few modern opinions that were more callously written than Gorsuch’s TransAm dissent. Here are the basic facts. Alphonse Maddin was a truck driver for TransAm. Late on a January night in temperatures below zero, he discovered that his trailer’s brakes had locked up due to the cold weather. (The truck itself could drive but not when attached to the trailer). He called TransAm’s road service for help at 11:17 p.m., and then discovered that the truck cabin’s heat was broken. He fell asleep and woke up two hours later with a numb torso. Maddin also could not feel his feet. He called the road service again, and they told him to “hang in there” despite the life-threatening conditions. He waited about 30 more minutes before unhitching the broken trailer. Although his supervisor ordered him to stay, Maddin decided to drive off with the truck after almost three hours in the subzero cold. A service truck did arrive 15 minutes after he left, but it’s hard to blame him for deciding not to risk his life. It’s amazing he waited so long at all. TransAm fired Maddin for abandoning his trailer. Maddin filed a complaint with the Occupational Safety and Health Administration, an agency of the Department of Labor. He claimed that TransAm had violated the whistleblower part of the Surface Transportation Assistance Act, which prohibits an employer from firing an employee who “refuses to operate a vehicle because … the employee has a reasonable apprehension of serious injury to the employee or the public.” The agency concluded that he had indeed been fired for refusing to operate his vehicle, and that he had a reasonable apprehension of danger. Here’s where we get to the legal dispute. TransAm argued that Maddin did operate his truck, so he was not covered by the text of the statute. In the appeal to Gorsuch’s panel (three judges on the 10th U.S. Circuit Court of appeals), two judges applied a rule called “Chevron deference,” which means that if a statute is ambiguous, and if Congress delegated interpretive power to an agency, then courts must defer to any reasonable interpretation by the agency. The statute did not define the word operate. The agency decided the word operate includes not only driving but “other uses of a vehicle when it is within the control of the employee.” In other cases, the agency had decided that partially unloading an overweight trailer and driving counted as a “refusal to operate,” because it was a refusal to operate in the directed manner. The majority of the panel also noted that Congress passed the statute so employees would be protected for bringing safety risks to their employers’ attention. Considering all of those factors, the majority found the agency’s interpretation of the ambiguous statute was reasonable. Now, Gorsuch has already told the world he does not believe in Chevron deference. Given that, he was welcome to entertain a better interpretation than the agency’s. For example, instead of focusing on the word operate, one could conclude that the word vehicle is open to interpretation—that the vehicle here was the truck and trailer together. (Legal scholars have noted the ambiguity of the word vehicle for decades via the famous “No Vehicles in the Park” example.) Thus, Maddin refused to operate his vehicle—the truck and trailer—and only operated the truck. The majority probably did not discuss this alternative interpretation because they were engaged in Chevron deference, and deferring to the agency means focusing on its stated interpretation. [S]omeone [at TransAm] gave him two options. He could drag the trailer carrying the company’s goods to its destination (an illegal and maybe sarcastically offered option). Or he could sit and wait for help to arrive (a legal if unpleasant option). The trucker chose None of the Above. Unpleasant? An unheated truck cab in subzero temperatures for three hours? Reading Gorsuch’s dissent is unpleasant; Maddin’s “choice” was life-threatening. Gorsuch throws out “None of the Above” like someone who has thought much more about LSAT multiple-choice questions than about life-and-death decisions. Gorsuch seems to understand the employer’s sarcasm was wrong and exploitative, and yet further along in the dissent he somehow can’t help himself from engaging in that same kind of sarcasm. Turning to the statute’s “refuses to operate” text, he writes, “And of course, nothing like that happened here.” “Of course,” as if this were an obviously easy case. Later, Gorsuch says the statute is “perfectly plain.” If Gorsuch finds this case so simple, it’s a warning he will oversimplify future cases when it suits his ideology. He then turns to the facts: “TransAm expressly … permitted him to sit and remain where he was and wait for help.” Sure, they permitted him to freeze. Where another dissenting judge might have expressed some sympathy but lamented that the statute was not written more clearly, Gorsuch piles on more derision: “Maybe the [Labor] Department would like such a law, maybe someday Congress will adorn our federal statutes with such a law.” Adorn, as if this safety statute was just a fanciful decoration. Let them eat cake. First, Gorsuch is again dismissive of the actual facts. Second, it’s a terrible analogy—a self-parody of the textualist who does not take context seriously. Most rigorous textualists acknowledge that context always matters when you’re trying to understand how a word is used, but in this case Gorsuch refused to consider context. Without making safety and danger part of the context, the workplace safety whistleblower statute does not make sense. Gorsuch’s references also come from his own cloistered world, citing the standardized test (“None of the Above”) and the aspiring novelist. Third: “Good luck”? Which judges write like this? Those who aspire to be the next Scalia. Early in his career, including his first decade or so on the Supreme Court, Scalia was a powerhouse, an engaging writer, and a generative thinker. But by the mid-1990s, he’d become increasingly acerbic. For the most part, he saved his acid pen for colleagues, O’Connor and Kennedy in particular. Gorsuch in this case is abrasive toward an unlucky litigant. It’s injudicious and frigid. In the end, Gorsuch didn’t just do a disservice to his own nomination with this opinion. He also did a disservice to his doctrinal cause: empowering judges over agencies to interpret the law. After I had been so enthralled with Gorsuch’s critique of Chevron, his TransAm opinion serves as a powerful warning against overturning it. Such a move would open the door for judges like Gorsuch to oversimplify cases, take statutes out of context, and serve ideological interests. Moreover, his lack of self-awareness of his theory’s flaw plus his acerbic dismissiveness of real-world conflicts are not a good sign that he has the appropriate judicial temperament for the Supreme Court.